I’m excited to announce a joint podcasting venture with Josh from easywdw.com, and Bret who can be found at @Schmoofy on Twitter. The new podcast is titled Walt Loved Podcasting, and it covers our opinions, reviews, and random thoughts of everything going on at Walt Disney World. The three of us all live in Orlando and visit the parks weekly, if not daily, which gives us a somewhat unique perspective on the happenings at Walt Disney World. Josh runs easywdw.com (a great site), and covers Walt Disney World touring and planning better than anyone. He does a wonderful job of sharing real world crowd experiences and is able to provide his readers with actionable tips and tricks to maximize their time in the parks. Bret has a vast amount of knowledge of not only Walt Disney World, but the theme park industry as a whole. From Walt Disney World to Knott’s Berry Farm, Hershey Park to Busch Gardens, Bret has an encyclopedic knowledge of rides and fun facts to add to any conversation. Be sure to give him a follow on Twitter at @Schmoofy. We’ve rolled all of that up into a podcast and hope that we’ve delivered it in an entertaining fashion. We’ve already released our first episode dedicated to Tron at Magic Kingdom. We talk about the project details and if it will fit into the Tomorrowland of today. We’ve made the podcast available on some of the major platforms, and linked below. If you don’t see your podcasting platform of preference, just send us a tweet at @WaltLoved and we’ll be sure to add it as soon as we can. As a side note, make sure you listen to the Tron episode titled “Walt Loved Tron and Better Audio”, as we corrected some of the audio issues in our first upload. We will stick to a once-a-week release schedule with new episodes published every Wednesday. Occasionally, we’ll publish more episodes off of the normal schedule like we did with the 2019 Festival of the Arts podcast released last night. Of course, I’d be remiss if I didn’t mention the already amazing support we’ve received. 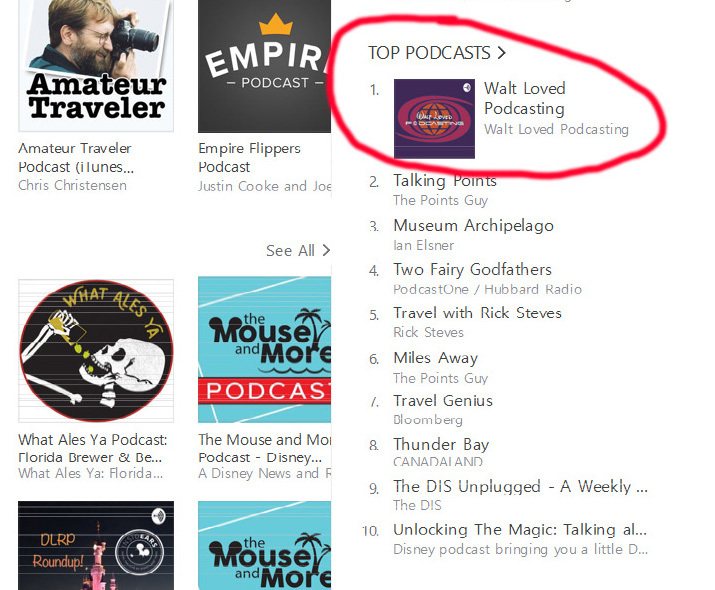 As easywdw.com (a great site) pointed out, we debuted as the top podcast in the Travel and Places category. Thank you to those who have already listed and welcome to those of you who will be new listeners. We look forward to hearing your feedback and interacting with you on Twitter at @WaltLoved!